The most challenging thing about the second sock was trying to make it match the first the one. Yes, it matters. I had to re-knit the gusset because the lace decreased too quickly - more guesswork here. Then, I had to re-knit the toe, because it seemed twisted and I couldn't remember where the heel ended and the instep began. Overall the pair ended up more or less symmetrical, I think. 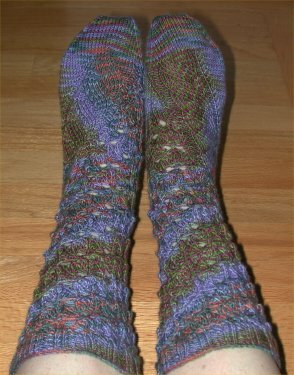 I do like the different pooling action on both feet, and the cool diagonal striping on the legs! Love your socks. I am just now struggling through the 1st lace repeat and worrying about the stitch marker placement. I will persevere. This page contains a single entry by Celadona published on November 19, 2006 10:46 AM. "Titania" Part I was the previous entry in this blog. Diamonds & Purl Cashmere Camisole is the next entry in this blog.